The 3,500 Watt 48S14.250BC Bidirectional non-isolated DC/DC converter provides a complete solution for in-vehicle power distribution in 12V/48V battery configurations for a variety of applications including micro and mild hybrid automotive systems. The bidirectional DC/DC converter charges a low side (12V) battery during normal operation (buck mode) and charges or assists the high voltage (48V) battery in emergency situations (boost mode). The bidirectional DC/DC converter operates more as an ideal current source with variable direction, thus allowing energy transfer between two voltage domains. Voltage feedback maintains output voltage within the acceptable operating range and eventually allows a custom charging profile for the battery pack. It regulates the average current flowing between the high voltage and low voltage ports in the direction selected via CAN interface. It is packaged in an unprecedented low profile 9.45” x 5.366” x 0.725” mechanically enclosed package weighing only 2.86 lbs. The package makes the unit ideal for harsh shock and vibration requirements as well as easy integration with a battery pack. Four M8 bushings are provided two for power connection and two for ground connections. Overcurrent, Overvoltage, & Over-temperature Protection. All protections are latching. 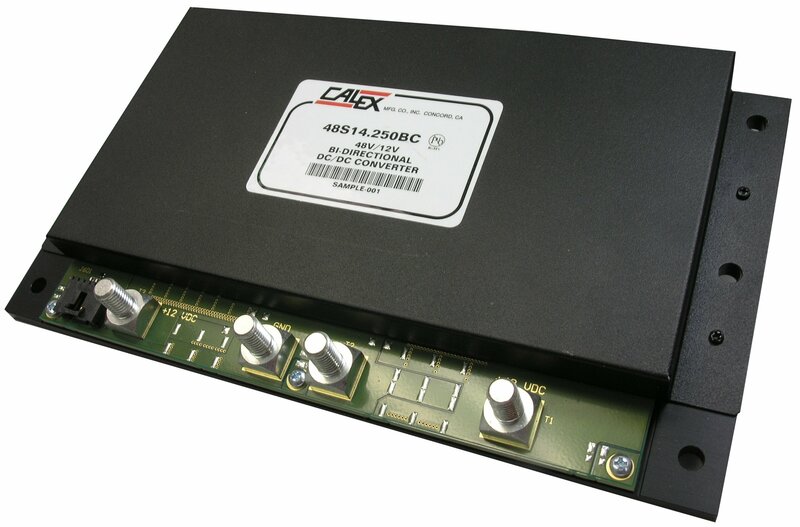 The 48S14.250BC converter is backed by Calex’s Five Year Warranty.